Randonneurs are long-distance unsupported endurance cyclists who cover distances between 200km and 1200km and beyond. Randonneurs are long-distance unsupported endurance cyclists who cover distances between 200km and 1200km and beyond. Randonneuring has its roots in France and every four years in August Randonneurs from around the globe gather in this country to participate in the 1200km event Paris-Brest-Paris (PBP). 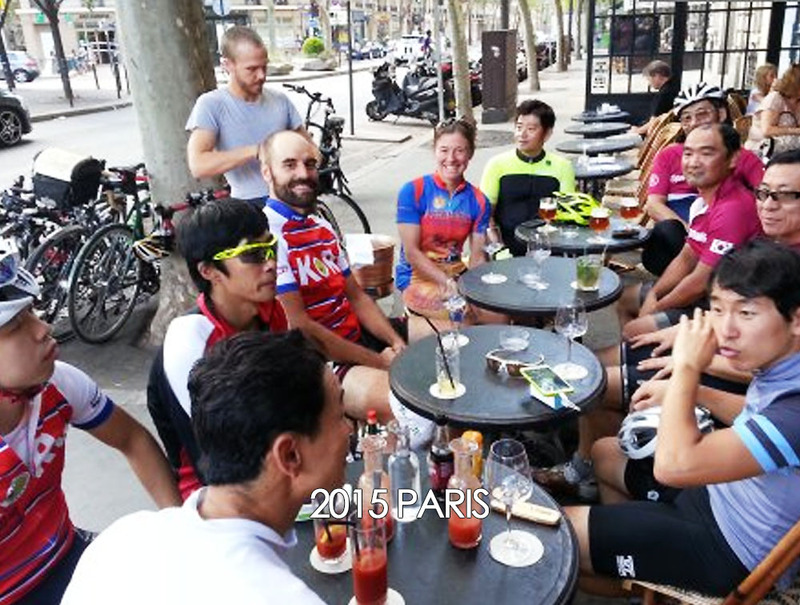 Korea Randonneurs were established in 2009 and the first brevets were held in 2010. Now there are more than 1000 active members and the Korea Randonneurs Facebook page is a lively medium where members share information and where announcements are made. All Korea Randonneurs brevets have been sanctioned by Audax Club Parisien (ACP 603000) and can be used to qualify for PBP and other international events. 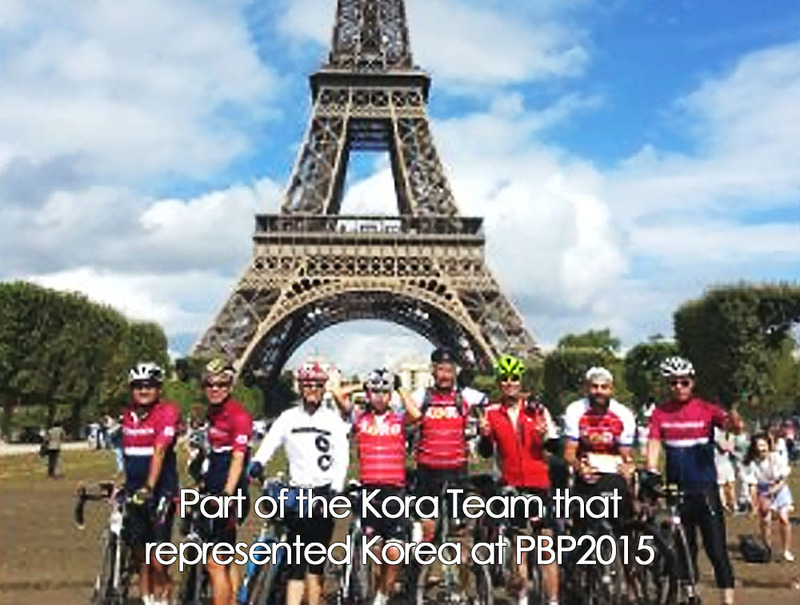 If you are interested in purchasing a 2016 Korea Randonneurs jersey and/or bib shorts, please visit the KoRa Shop website. These distances are a minimum, it is usual that the actual distance is 3 to 15 km more. However, the time limit is not altered regarding the actual distance and remains as listed above. A brevet is not a race; completion is a personal achievement and results are never listed in order of time of completion. Upon successful completion of a brevet, riders receive a certificate and can purchase an ACP issued medal documenting their achievement. A brevet as listed above is called a BRM (Brevet Randonneurs Mondiaux); successful completion of such a brevet counts for awards like Super Randonneur and KR5000. Each successful finisher accumulates points (1 point per 100 BRM kilometers) for the Korea Randonneurs organization and every year a list is published of all randonneuring organizations in the world, showing the ranking of each country with respect to the points accumulated. Apart from the BRM, there are RM(Les Randonneurs Mondiaux), brevets of 1200 km and more. Korea Randonneurs organizes each year a 1200 km brevet, for which a time limit of 90 to 92 hours is applied, depending on the actual distance. In order to obtain a proof that a rider has finished a brevet along the prescribed route, controls (checkpoints) are established, typically 60 to 100 km apart, but so that the most logical way between controls is via the prescribed route. Controls are needed to prove that the rider did not take a shortcut. The rider has a brevet card, which must be stamped and signed (and time marked) at the start, finish and at each control. In most cases a control is a convenience store, the store clerk provides the stamp and signature. Any form of human powered vehicle is acceptable, but the vehicle must be powered solely by the rider. Riders must comply with the Rules for Safety and Night Riding and obey Korean traffic rules. Each rider must be self sufficient. No personal follow cars or support of any kind are permitted on the course, personal support is only allowed at checkpoints. It is also not allowed that riders are escorted by cyclists who do not take part in the event, because this can be regarded as support. The prescribed route must be followed. If a rider deviates from the prescribed route (either purposely or accidently), he has to turn back to the point where he left the prescribed route and resume from there. Violation of any rule and not arriving within the time limit results in disqualification.